After months of wedding planning and the excitement of the big day itself, it’s no surprise that couples are due a honeymoon. After all, it’s a glamorous way of marking the start of your married life, not to mention it’s the perfect excuse to decompress and enjoy some quality time together. The best part is you don’t need to break the bank on a luxury holiday across the world – Europe is actually filled with seriously romantic spots, some of which can easily be visited on a post-wedding budget. We’re talking cities packed with culture, breathtaking white sand beaches and dreamy hidden spots. Need more inspiration? We’ve also got a round-up of the world’s most romantic destinations . 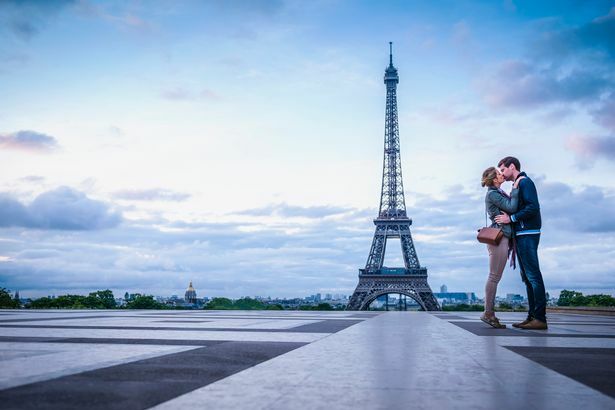 Paris may feel like an obvious choice, but there’s a reason that the City of Lights is hailed as one of the most romantic places in the world. Spend your days wandering along the cobbled streets and stopping off at the cosy cafés for some of that world-famous food, check out the landmarks from the Arc de Triomphe to the Eiffel Tower, and enjoy some seriously glamorous date nights thanks to the opulent restaurants and dazzling cabaret shows. You don’t need to splurge on accommodation either – the city is filled with cheap hotels that have a touch of luxury too. Meanwhile, easyJet Holidays can be a good source for cheap flight and hotel packages. If you’re both more prone to going exploring rather than sitting on a beach all day, the Amalfi Coast could be ideal. Think small, picturesque beaches, charming quintessentially Italian towns, cosy hotels, local foodie hubs with seriously good views, and of course, that epic rugged landscape. Highlights range from the colourful fishing village of Portofino to celebrity hotspot Lake Como . Shearings Holidays offers luxe coach breaks to the Italian lakes , or if it’s a cheap package you’re after LoveHolidays has holidays from £160pp . With its white-washed buildings, iconic blue domes, luxury hotels and cosy restaurants, it’s no wonder Santorini is a hit with couples after a holiday of lifetime. Sip on cocktails at sunset taking in the views from one of the bustling waterside tavernas, discover the Instagram-worthy streets or explore the hidden coves along the coast. As for where to stay, TripAdvisor has a round-up of the best romantic hotels according to traveller reviews. Not sure Santorini is quite right for you? Check out our guide to the best Greek islands for more inspiration. You’ll feel like you’ve stepped into a real-life fairytale thanks to the incredible castles to be found (and visited) in the Loire Valley, as well as the sweeping landscapes. Then of course there are the region’s epic vineyards offering dedicated tours, tasting sessions and pairings with that sumptuous French cuisine. Find yourself a cosy boutique hotel in the region as your base ( Booking.com is a good source ) and spend a few days exploring and immersing yourself in the laidback atmosphere of the place. If you’re after a getaway that’s a mix of sightseeing and beach holiday, Corfu could be the ideal location. The Greek island boats beautiful shores and luxury resorts, as well as eye-catching olive groves and quaint villages. Highlights include Corfu Town with its cobbled streets and pastel hued Venetian inspired buildings, while Danilia Village is a must-visit for history buffs; it’s a replica of a 1930s Corfiot village. Fans of TV show The Durrells can also go in search of the filming locations which were based here. Olympic Holidays offers some luxury packages to Corfu, while TravelSupermarket is useful for comparing prices if you can be flexible with dates. Rome is filled with historic landmarks, incredible restaurants and a vibrant nightlife – basically, everything you need for a fun, culture-filled city break. Whether you’re planning to explore the Colosseum or want to spend some time wandering around Vatican City, there’ll be plenty to keep you busy on a long weekend here. Check out our Rome city guide for top tips on the attractions not to miss, the best restaurants and top cheap hotels. The Croatian island of Hvar is renowned for its luxurious resorts, epic party scene, swanky bars and elegant restaurants. It’s a must visit for couples who love to be surrounded by hustle and bustle – but the swish hotels also make for a peaceful retreat if you do want to get away from it all for a bit. And of course there’s the fact that Hvar is home to some of the best beaches in Croatia . Despite its luxury offering, there are ways to visit on a budget without having to compromise on the glamour; for example, Lastminute.com has hotels from £39 a night . Whether you’re after a golfing holiday, beach retreat or action-packed getaway, the Algarve caters to a wide range of holiday types. For a start there’s so much to see and do while you’re there, not to mention it’s home to some of Portugal’s prettiest beaches . Because it’s a popular holiday destination, it’s relatively easy to find budget-friendly packages to the Algarve; On The Beach , TUI and Teletext Holidays all offer a range of options. If you want a mini honeymoon while saving up for a bigger holiday further down the line, then Bruges could be ideal. Just a short Eurostar journey or flight away, this historic city has everything you could want for a long weekend; cosy romantic hotels, pretty waterside views, awe-inspiring historic buildings and restaurants serving up hearty meals. Head to the city’s Market Square where you’ll find most of the highlights from the Belfry Tower to the bustling cafes. Eurostar has rail and hotel packages to the city, while Thomas Cook also offers tempting deals. With its luxurious resorts, picturesque harbour views and balmy temperatures, sun-soaked Mykonos has long drawn in newlyweds looking to kick off married life in style. Hotels often come with luxury spas and poolside views that are the stuff of dreams, while the bustling Mykonos Town has plenty of bars and restaurants for a fun date night out. For something truly special, head to the island’s ‘Little Venice’ where you’ll find the cosy restaurants for a romantic tête-à-tête. TripAdvisor has a handy round-up of the best honeymoon hotels in Mykonos based on travellers’ reviews.